Using ReferralCandy, your customers can refer friends and earn rewards to go towards their next order. Your customers will see referrals and rewards within their ReferralCandy portal. Unfortunately, you can't customize this within their platform. 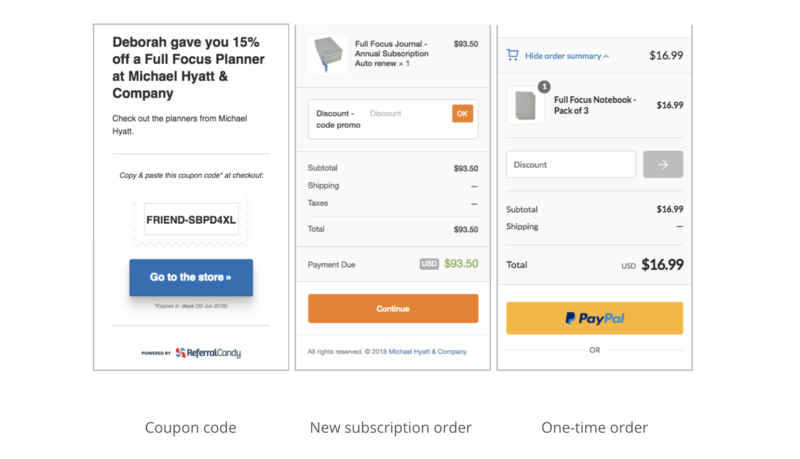 Once your customer has applied a discount, you can see it on the customer's subscription order page that a discount has been applied to a future order. There are two integration options for your Shopify store: Referral Candy Integration and Referral Candy API Integration (Beta). Is ReferralCandy (Beta) Right for Your Store? For example, you may want to offer a customer 100% off their next subscription order when they refer 5 friends. In the later steps in this guide, you would just select Custom for Reward Type. An example would be offering your customer $20 off when they refer 5 friends. When they achieve this, you will see within ReferralCandy that you will need to PayPal them $20. In the later steps in this guide, you would just select Custom for Reward Type to enable PayPal payout rewards. The cash payout would be handled via ReferralCandy directly. This can be applied to one-time orders only. Warning: The Reward Type must be Custom, otherwise ReferralCandy's API will block our code. This requires merchants to fulfill the reward directly with the advocate. In this case, ReCharge's integration serves the role of the advocate, allowing for open API calls. Note: A percentage off is all that can be applied to a subscription order. A cash amount cannot be applied to a recurring subscription. Be sure that you have installed the ReferralCandy app in your Shopify store. If you haven't done this, please visit their app page here. 2. Click the Third party integrations drop-down. 3. Select ReCharge and click Save Changes. 2. Click the Give advocates... drop-down. 3. Choose Custom as Type of Reward and enter in the reward description (save this description for later) as you'd like. As stated earlier in this article, you can only apply a percentage off subscription orders in ReCharge with ReferralCandy. If you wanted to give a cash payout, that is handled on your end with a PayPal transfer. You can set it up so that rewards are triggered for advocates based on the number of referred purchases and size of purchase. To set this in ReferralCandy go to Configure Referral Reward and configure the section Conditions for reward. You can set it up so that rewards are triggered for advocates based on the number of referred purchases and size of purchase. To set this in ReferralCandy go to the Advanced settings section in https://my.referralcandy.com/reward and configure the Rewards Setting. 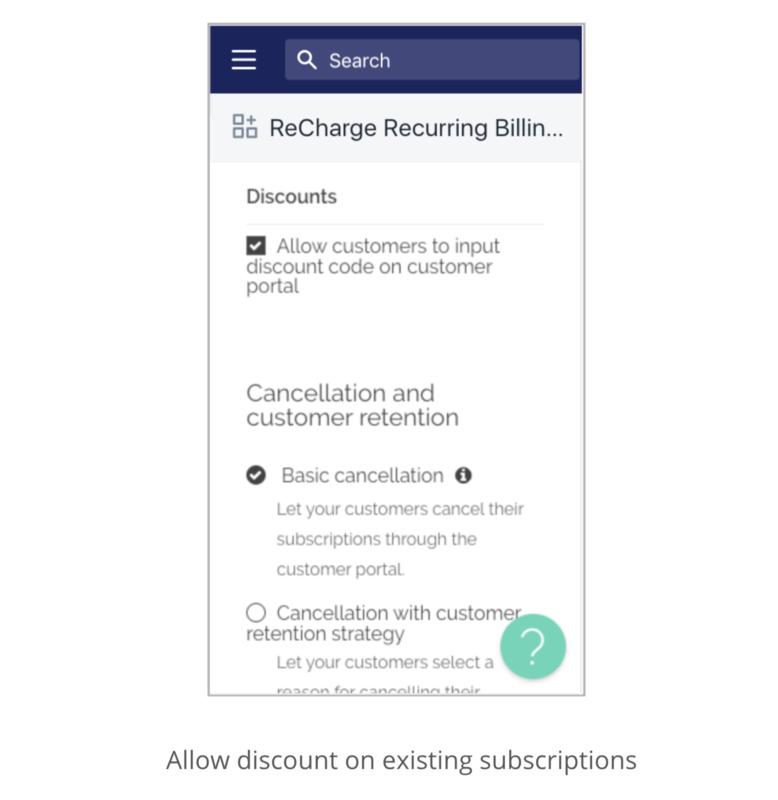 For Friend Offer Coupons used on subscriptions, you need to create the discount within ReCharge, check out our Discounts article on how to configure discount coupons in ReCharge. If you're selling one-time products as well as subscriptions, you will need also to create these discounts within Shopify also. You need to set up coupons with ReferralCandy if you're planning to offer the friends of shoppers an incentive to buy subscriptions from your store. A) In ReferralCandy go to https://my.referralcandy.com/reward and select the Give friends... section. C) Enter the description and click Next. A field to enter the coupon code will then appear. D) If the coupon is for one-time purchase items, enter the Shopify Discount Code you created. If the coupon is for subscription items, enter the ReCharge Discount Code you created. If the code is not exactly the same as the one you created in Shopify or ReCharge, the referral will not work. E) Set an expiration date (if any) and click Add Coupon Code when you're finished. Step 5: Get your app ID and Secret Keys from your ReferralCandy dashboard. A) In ReferralCandy click on the account owner name on the left navigation menu and then My Profile. B) Under API tokens, copy the API Access ID and API Secret Key. C) Copy the App ID under Plugin tokens. 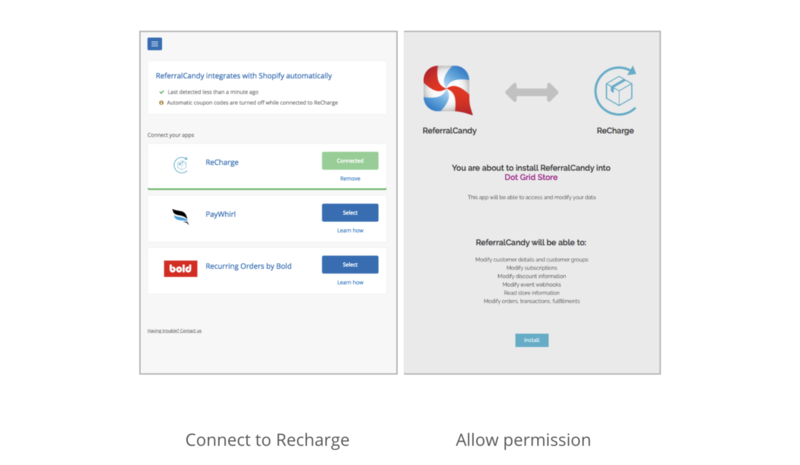 A) To copy your keys into ReCharge, go to the ReCharge Dashboard > Integrations > ReferralCandy. B) Enter your App ID and Secret Keys. C) Enter your Reward Description. Based on what you input in ReferralCandy for the advocate reward (see Step 1), you'll want to paste the exact same Referral Award description as entered in ReferralCandy, otherwise, it will not work. Note: Entering this Reward Description will automatically generate a discount code in ReCharge for your customer advocates. This is a different code than the one you created for your referrers to send to friends. This code is designed to apply to a referrers' existing subscription after the referral rules you created are met, such as getting the required 2 friends to purchase. D) Enter Percentage Reward Off. (Optional) You only need to do this if you're offering a percentage off. If you aren't, you will instead be rewarding people cash via PayPal. You can review the list of referrers' by selecting Advocates under Manage in ReferralCandy. For subscription items, you'll need to create a referral link, create a referral qualification of 1to make it easy to test. Then send it to someone to make a real purchase with. After testing, check to see if the advocate's upcoming order has been discounted properly in ReCharge. After checking, be sure to refund the purchaser. Click here to see ReferralCandy's process for testing. Note: When conducting a Referral Candy test, we recommend using a different computer on a different network to make the referred purchase. Otherwise, you can risk the referral being blocked by ReferralCandy's fraud detection measures. It is also advised to clear your cookies before making the purchase as well. Is Referral Candy API Integration (Beta) right for your Shopify store? If your Shopify store offers BOTH one-time product on Shopify and recurring subscription on ReCharge, you should use Recharge API Integration (Beta). How do you switch on Referral Candy integration on the Shopify store? Note: This is currently in Beta because Recharge API is in Beta and not fully available yet to all merchants. 1. Make sure if your ReferralCandy and Recharge installed on your Shopify store. How will your customers get their referral rewards? For general questions regarding ReferralCandy's system, check out their help docs or feel free to contact them directly. What if I offer the first month free, can I make it so points can only be applied for the second subscription interval? ReferralCandy simply works by converting via the discount codes that are generated through its system. It doesn't measure the lifecycle of a customer and reward conditionally. The ReCharge team has been exploring how something like that would work but at this point that is not something that is possible. However, you are able to set it up to reward manually in PayPal. You'd still have to track who has been referred in ReferralCandy, and then check in ReCharge to see if those referrals have stuck around for a 2nd month, then issue a cash reward to your advocate. How do I test ReferralCandy? First, you must have ReferralCandy configured with the integration steps below. You will then need to do a test purchase to share it with a friend. Once you have run the test you can 'pause' the referral campaign. You can always refund your friends' purchases after testing. For one-time purchase items, click here to see ReferralCandy's process for testing. What rules or limits can I set for my customers? Within your ReferralCandy, you can set the number of times a person can refer a friend in order to get a reward. You can also set order sizes for referred purchases to count towards a reward. For details on how to configure this, reach out to their dedicated support team. How and when are rewards applied? Rewards earned for a customer are applied automatically as percentage discounts to their future subscription orders. You can't customize what upcoming order a discount is applied to. If you choose to pay customers via PayPal, then rewards with be applied outside of ReCharge. Note: Only one reward per order can be applied. Make sure you've added your Referral Candy API key, Secret Key and APP ID correctly in ReCharge. The naming conventions are different between apps - below is a key to compare if the keys are correctly input in ReCharge. Warning: The Reward Type must be Custom, otherwise Referral Candy's API will block our code. This requires merchants to fulfill the reward directly with the advocate. In this case, ReCharge's integration serves the role of the merchant, as the custom configuration allowing for open API calls. Has an advocate reward applied to an advocate's next charge? On the Referral Candy integrations page, click View All Rewards - this will show a list of all rewards pending and fulfilled. Search for the customer based on email. You should also check an advocate's individual ReCharge account to see if a reward has applied. A Referral Candy advocate reward should apply to the advocate's next queued charge in ReCharge. Check their address view and see if a discount code with the same title as the "reward description" in ReCharge's integration settings has applied to the next queued charge. If it's not showing, the customer definitely did not receive a reward. It could be a fraud check that blocked it, or they are pending in the fraud waiting period. The reward description in Referral Candy is different than the ReCharge Referral Candy discount that is set up in ReCharge. Example: ReferralCandy displays the discount name as fifty_off but in ReCharge the discount is fifty_percent_off. It must match exactly to work. See first section on how to check this. The customer has canceled, no reward can be applied but will be if they re-activate. The customer already has another reward discount applied to their upcoming charge, so the reward will be applied to their next charge. There is no way for us to know if the current discount is greater or less than the existing discount, and we do not have the ability to apply two simultaneous discounts. The reward has already been applied. It will say delivered in this case. The reward type in Referral Candy is set to coupon or cash instead of custom. If you find out that you need to manually set a reward as fulfilled or unfulfilled, this can be done on the View All Rewards page by clicking Set as Pending or Set as Delivered. Still have questions? Reach out to ReferralCandy's dedicated team.